Who says cookies can’t be healthy?! 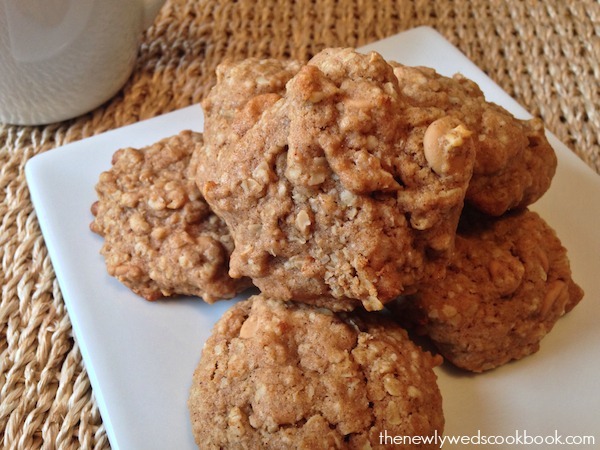 Last night, I made these oatmeal peanut butter cookies! And let me tell you, they were great! They have no butter added and no granulated sugar! Just 1 tablespoon of light brown sugar! Not too bad, right?! And if you don’t like peanut butter, or are allergic to it, you can always use chocolate chips instead of peanut butter. Or try both! Whatever suits your fancy! 2. In a medium bowl, whisk together the whole wheat flour, rolled oats, salt, baking powder, baking soda, cinnamon, light brown sugar and nutmeg. 3. In a Kitchen Aid, beat together the egg with 1 tbsp of water. Then, add in the coconut oil, honey, and the vanilla extract. Mix well. 4. Slowly add the dry ingredients to the wet ingredients and continue mixing on low speed. 5. Once well combined, add in the peanut butter chips and until just combined. 6. On a greased cookie sheet, place 1 tbsp sized spoonfuls of mixture onto the sheet. 7. Stick in the oven for 10 minutes.